The museum Edward Durell Stone designed at 2 Columbus Circle had a marble facade contoured to the odd shape of the tiny, curved block. Most of each side was solid, but arriving at the corner, the edges were perforated with holes, creating a dotty borner running all the way around the building. When the Museum of Arts and Design hired Allied Works to renovate and resurface the building, those porthole windows were the first to go, replaced by long, narrow strips of glass that afford a better view of the circular traffic, and which wrap up, down, and across the new walls and floors. Circles, the first-floor lollipops, the top-floor Venetian arches, all these vaguely Islamic touches were banished in favor of neo-modern linearity. Only in the basement auditorium do circles still reign. 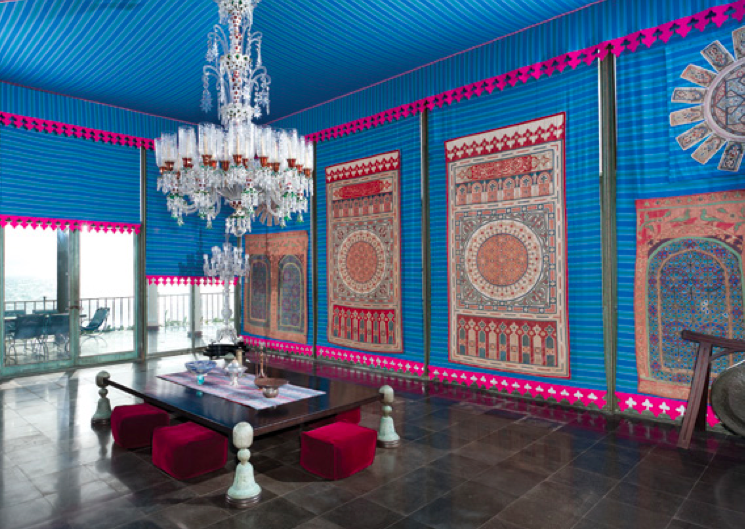 So it was with a great deal of amusement that I arrived at MAD's new exhibition, "Doris Duke's Shangri La," and found that the circles, the Islamic pierced screens, the carpets, and the globe-trotting exoticism were back. They give the museum's plain vanilla gallery more atmosphere than it has had in many seasons. The exhibition, which runs through February 17, 2013, is devoted to the contents of Doris Duke's Honolulu residence, built in the 1930s to house spoils from 60 years of collecting from Spain, North Africa, Central and South Asia, and the Middle East. (The New York Times review is here.) 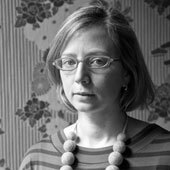 There are architectural drawings from the past (including an unbuilt house inspired by the Taj Mahal) and large-format photographs by Tim Street-Porter from the present, displayed on white easels that suggest campaign furniture. There are images of Duke in ethnic garb, and an assortment of clothes and jewels (rubies figure prominently). There are suzanis and inlaid chests, tent panels and hanging lanterns, objects and decor from across the centuries and continents. The juxtapositions are everything museums have been telingl us we shouldn't do. The ornamental revelry is everything modernists would never do. Except Edward Durell Stone did, thirty years after Doris Duke, here and at the U.S. Embassy in New Delhi. There is something slyly undermining about the whole enterprise of exhibiting such a house. The Street-Porter photographs make it look stunning, down to the marble Moorish bathroom. The screens, installed in front of MAD's long windows, are a shadow reference to Shangri La's own ethno-technological architecture, where a retractable glass wall abuts a carved Moroccan ceiling. The architect of Shangri La was Marion Sims Wyeth, of Palm Beach. In aerial shots you can see that the house is modern in plan, in a Wrightian way, with steps falling down the hill, and rooms arranged around outdoor rooms. Tropical travels. Duke called it a "Spanish-Moorish-Persian-Indian complex," which is a far cry from the correctly labeled (formerly Islamic) galleries at the Metropolitan Museum: Art of the Arab Lands, Turkey, Iran, Central Asia, and Later South Asia. Despite the presence of critique, as in Afruz Amighi's 2010 "Rocket Gods," this is an exhibition about decorating at the very highest level. Duke and her architects and designers turned ancient and valuable objects into wallpaper, through painted vitrines and layered shelving. In the exhibition there is a photograph of Duke standing in a courtyard, surrounded by apparently identical inlaid chests. The chest she chose is on display further along. It is just shopping. Despite the different (and decadent) reality Duke occupied, there is something endearing about the shameless display. She loved these things, she lived with them, and she decided how they would all go together. Shangri La, for me, falls into the category of so bad it's good, except in this rare case all the over-the-top elements are museum quality. I appreciate seeing rubies and rugs and architecture and landscape and lighting all together. This mixing is what a design museum should do, but too often one category is broken out from the domestic herd. The mix, and the gloriously colored photographs, give the gallery life and a certain otherworldly light. 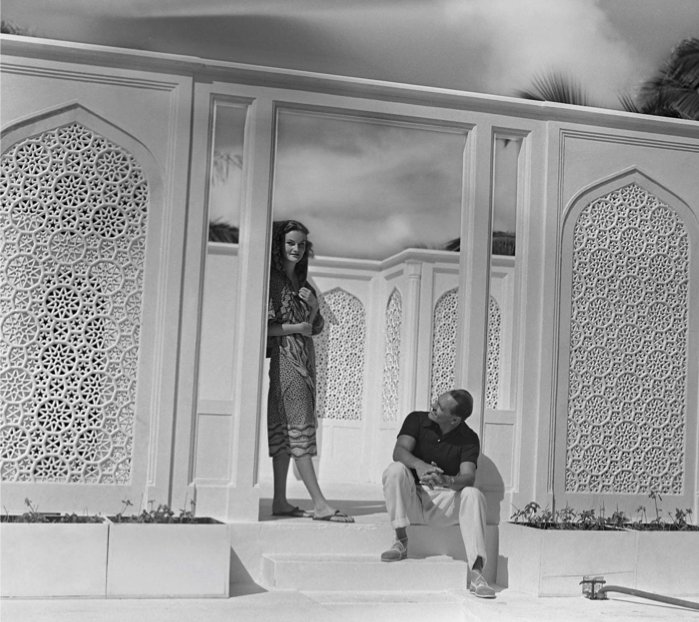 What I got from "Doris Duke's Shangri La" was not deep, but it was pleasurable. And my mind has been running to connections ever since. Is there a hint of David Hicks in the dining room's pink-and-blue circus curtains? How chic to have a corduroy sectional in front of your retractable wall. And, surely there were hidden meanings worked into gorgeous patterns long before the contemporary artists began weaving, cutting and projecting. Doris Duke made her own ahistorical, ageographical gesamtkunstwerk, and since I never would have been invited for a mai tai, this is a terrific second best.